The Six Nations Championship is underway, which has us thinking about project management (of course). Dr Jeff Sutherland and Ken Schwaber actually invented a rugby-inspired management process named Scrum back in 1995. Like a rugby scrum, its short meetings offer a chance for project team members to reset and regroup. 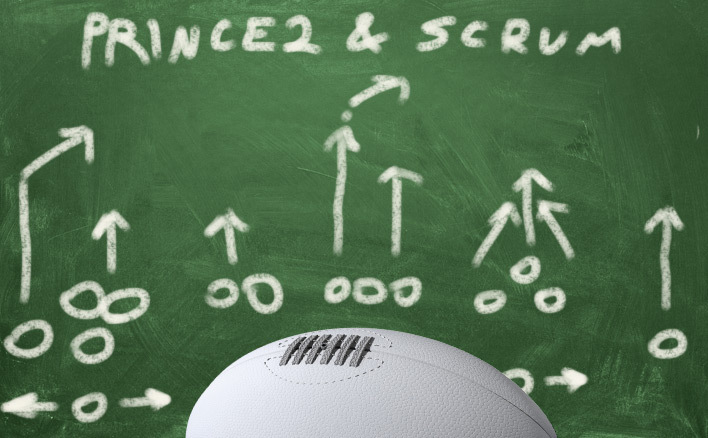 PRINCE2’s 2017 update and the PRINCE2 Agile course make it easier than ever to play PRINCE2 and Scrum on the same team. Here are two tactics to make it work, along with some potential obstructions to watch out for. The trick with any PRINCE2 project is to only use the processes you need. That’s why one method is to use Scrum but add some stabilising processes from PRINCE2, like the Risk Register or Lessons Log. You can drop these PRINCE2 processes in as and when you need them, like a utility player. If you want an agile environment with some more assurances, this is the way to do it. You can use the Sprint Backlog to let the product owner know how much effort these processes require. Then, you can weigh up how valuable they are. You might find, for example, that the Issue Log is easy to fill out during the Daily Scrum and it’s worth having it all documented. On the other hand, maybe the Sprint Review meetings negate the need for a PRINCE2-style Highlights Report. What you keep and what you scrap will really depend on the environment. Another method is to restrict Scrum to Work Packages. Here, you run a PRINCE2 project. The only difference is that the Work Package execution and delivery are done in Scrum. Here, PRINCE2 does everything except for the on-the-ground project work. This works well because Scrum is about project delivery and PRINCE2 doesn’t specify the technical ‘how to’. This is ideal for more PRINCE2-focused environments. The reason you’d treat a Work Package like a sprint is to make the development process agile. This lets PRINCE2 project managers leverage one of agile’s best advantages: swift delivery. At the same time, you retain the Business Case, defined responsibilities and other advantages of a PRINCE2 project. The Scrum Master is a servant-leader and not a manager. Instead of giving orders, they use scrum meetings to help the team reach a consensus and remove obstacles from their work. If the project manager has a friendly relationship with the team, they might be able to transition into a Scrum Master. Trying to do both jobs at the same time, however, creates problems. While team members have to report to project managers, Scrum Masters shouldn’t tell other team members what to do. Instead, if you’re a project manager and want to keep your role, let someone else from the team become the Scrum Master. As a PM, you can make their job a lot easier. While the Scrum Master deals with the product owner, you can be the team’s primary contact with higher management and other departments. You can also help the Scrum Master raise project impediments. If your goal is to work in or with PRINCE2 project teams, the Foundation certification is all you need. Team members, sponsors and other stakeholders only need to understand the principles and terminology. For actually running projects yourself, we recommend PRINCE2 Practitioner. For integrating Scrum into your projects, consider taking the next step with our PRINCE2 Agile certification. This qualification directly covers the agile processes including Scrum. Our course makes bringing these two methodologies together simple and understandable. However, if you have any questions at all, contact us here.